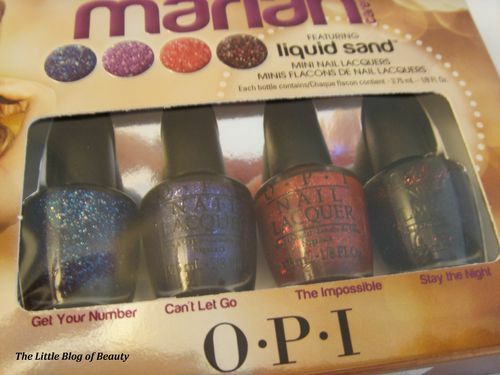 As many of you are probably aware OPI have just launched a new collection in association with Mariah Carey. The collection features 8 new limited edition shades, 4 of which feature a new nail effect called liquid sand. There are now several different types of nail effects to choose from ranging from leather and concrete to velvet and fur. However apart from shatter top coats I believe this may be the first nail effect that OPI have launched (I may be wrong!). Although I haven’t really tried any nail effects so far (apart from shatters) I am a big fan of OPI and liked the look of this effect so decided I would give it a try. 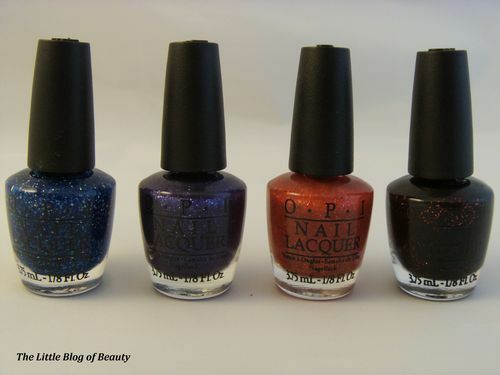 Just as these were launched Look magazine provided an offer code for 20% off at www.lenawhite.co.uk, which is the offical UK distributer for OPI. So I was able to get the Liquid Sand Mini Nail Laquers set for £10.36 rather than £12.95. 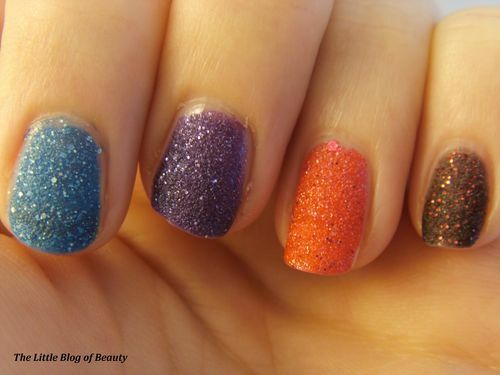 The mini set means you can try all 4 liquid sand’s without having to pay out a small fortune to buy each one. The mini bottles (3.75 ml) are super cute and let’s face it, how many bottles of full size nail varnish do you actually use until they’re empty unless it’s one of your absolute favourites. To use liquid sand you should use a base coat followed by two coats of liquid sand. A top coat should not be used, I guess because it will ruin the effect. This then dries (pretty quickly) to a textured matt glittery finish which does look just like (very brightly coloured) sand. This has a very similar look to glitter nail varnishes however I personally think it looks better. At first the varnish appears quite thin and watery (like you may need to keep applying several coats to get any kind of coverage) but just two coats is all you need for perfect coverage. As you can’t wear a top coat with this effect I’m not sure how long this will last without chipping but I have had this on for 24 hours and it still looks perfect so far. I am also wondering whether this will be as difficult to remove as glitter nail varnish, but I will update this post when I find this out! I do really like this effect and am glad I got the set as I can’t quite decide which is my favourite.